iGlucose® provides people living with diabetes a convenient and affordable diabetes care management solution, and healthcare professionals with a real-time view of blood glucose data and trends. Smart Meter enables the proactive management of diabetes through an innovative and diverse portfolio of data, technology, and solutions. 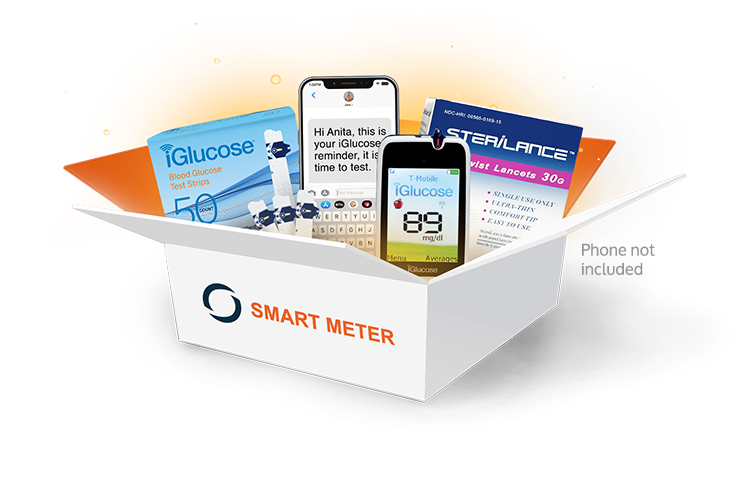 Smart Meter provides an easy way to access real-time and reliable blood glucose data so that healthcare professionals can make better clinical decisions, while saving time and money. Sharing of bG results can happen every time you test - no downloading or syncing required. Get real-time, reliable blood glucose data for your patients and leverage population health management dashboards. The iGlucose System increases your efficiencies and your ability to proactively manage your patients’ therapy plans. Partner with Smart Meter to enhance your product or service offering without relying on individuals downloading data. The iGlucose System provides seamless real-time, and accurate bG data. "iGlucose simplifies diabetes management and enables more personalized, cost effective care." "I shared my bG results with people in my Circle of Care. I’ve had valuable conversations that I’ve never had in eleven years of having diabetes." "iGlucose reminders are critical. My life is nonstop. Subtle reminders to test have created a consistent pattern of testing. My iGlucose System has really changed my life with diabetes." "The positive reinforcement I get from my iGlucose Virtual Coach works. My lower numbers reflect that." "Good job iGlucose! We integrated the iGlucose meter data into our system in one day. Kudos on an easy API."